This was meant to be one complete post but the more I sat and typed the more I appreciated that to do this part of the walk justice it would have to be separated into two sections: south and north. As I continued to type I realised that I would have to write it in four parts (NESW) if it was to be written in any detail. One huge post would be too much of a read in one sitting! It may not be apparent to some but London is surrounded by green open spaces and genuine countryside: miles and miles of it.In amongst its bulging suburbs and winding roads also exist the remnants of ancient woods now protected by some body or other with an interest in their preservation. There is also a body of people who are willing to put the hours in to help keep such spaces habitable for all to use and appreciate. The Capital Ring walk contributes to this sharing of our public spaces as it winds its way through a wide variety of parks, fields, commons, scrub land, urban spaces and just plain greenery than you could ever imagine! I’ve lost count of the number of parks and spaces but there’s not an existing stage which doesn’t have a green element and a variety of paths to follow. Long may it continue. On the first part of the first leg in Charlton there are a few pieces of greenery: Maryon Park, where the murder takes place in 60s flick Blow Up (starring David Hemmings and Vanessa Redgrave) and which leads into Maryon Wilson Park. 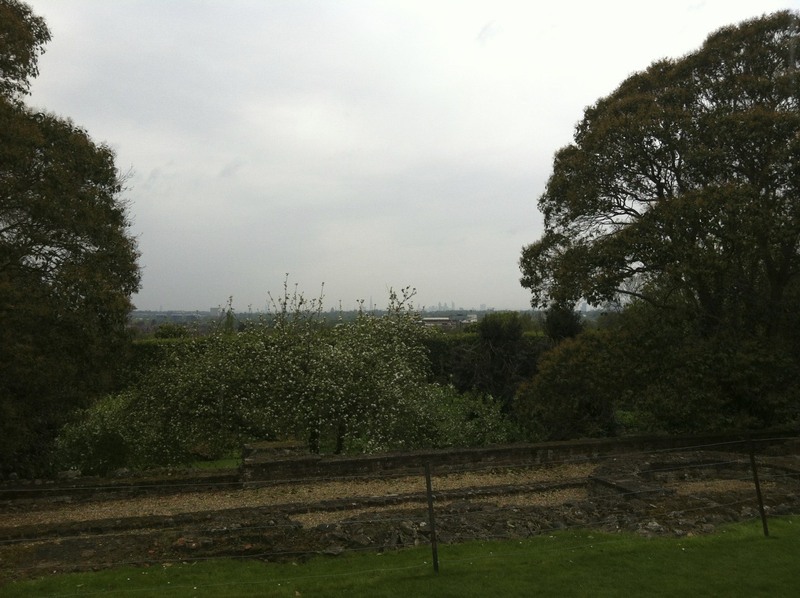 The windy expanse of Charlton Park follows leading into a ‘bland’ Hornfair Park which leads you across Woolwich Common. What could be a beautiful refuge from nearby traffic and high-rise living is a disappointing common peppered with scattered waste, beer cans and the abandoned clothing of both children and adults. One tree had so many discarded plastic shopping bags clinging to its branches that from a distance I mistook it as the site of a Tibetan monument with its prayer flags fluttering in a stiff breeze. Following this you emerge from a small, dark woods onto a broad plateau of sorts that is Oxleas Meadows which has a cafe at its ‘peak’ overlooking Kent and South-East London (photo above) . 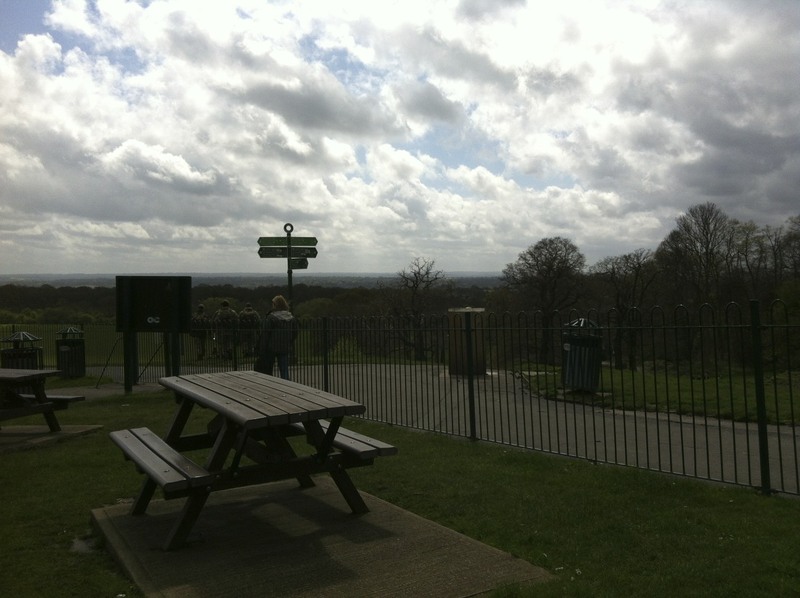 With a wide expansive view this a great place for a cup of tea whilst soaking up the vista before you.Shortly after you descend to the bottom of that view and into Eltham Park which is rather prim and pruned with diligent lady park attendants chewing the fat with local mother’s and wishing you well on your travels. Eltham Park is neatly bisected by the gargantuan A2 rumbling below it and its exit leads to an unspectacular path and arrangement of trees where jaded dog owners parade their prized pooches who bury their noses amongst the leaves and broken branches like prized-pigs truffle hunting in Tuscany. That will be the first and last time in which Eltham is juxtaposed with Tuscany. Grove Park sounds very promising but the blight of suburban sprawl has erased all that is left of the park near the grove that so tempted planners to name it so. Is there anyone alive who wouldn’t be seduced into rural living by such a name on a prized letter head? I can think of a few. There is no park here and what glamour there was has long faded. Row upon row of housing, some smart some not, squeezed into tight spaces like a big arsed man or woman determined to have that seat on a London bus.There are plenty of playing fields,though: the preserve of the social clubs which bought them in the 1930s or of well-healed schools with wealthy pupils whose parents can afford them. The third stage does contain one gem of a park in Downham which starts out as a huge ,broad field bordered by trees on its far side.I didn’t really expect much as the tarmac path gave way to a dirt trail and the trees obscured the light and drew me into a high wood.I walked ahead, following the path,and the trees were taller.I followed both the path and the small green Ring arrows and after skipping mud pools and swerving large, wet unleached dogs emerged next to a golf green and its pristine lawns. The path plunged down a slope towards a stream and the green disappeared from view though ahead and to the left of the opposite hill lay an even bigger swathe of verdant golfing greens basking in the morning sunshine.Once you arrive at the top of the brief climb there is a beautiful white mansion built by John Cator in the 18th century which now functions as a public golf club for those who want a game on a course that winds its way through a truly beautiful part of South London. This is Beckenham Place Park in the London Borough of Bromley and if you turn left out of the entrance you come to the High Street. Beckenham was, of course, the home and birthplace of The Beckenham Arts Festival curated by David Bowie and so has a special place in my heart. The final part of the SE parks section takes us to the huge Crystal Palace Park which is so big that it contains a national sports stadium within it and still exists comfortably without rubbing shoulders or getting too close. You enter the park through the Sydenham Gate in the south-eastern corner. This has the feel of a large park with an entrance leading to a nearby car park and then swiftly rises up a path to the boat lake and paths that make up the functioning park. If you continue up the slope this will lead you lead you to the site where the imposing Crystal Palace stood for seventy years once it had been removed being from Hyde Park after the close of the Great Exhibition of 1851.The palace was destroyed by fire on 30 November 1936. Skirting the Athletics stadium and heading west to the railway station brings us to the end of the SE Parks and the beginning of the SW Parks stage from Crystal Palace to Richmond which I’ll post shortly. Thanks for reading. The best view of London from the South and to all points North,West and East of the city is from the General Wolfe1 statue in Greenwich Park. At the top of a gruelling hill climb the visitor stands outside the Observatory astride the bifurcating line of the Meridian which is cauterized into the cobbles and asphalt. The burgeoning peaks of Canary Wharf loom before you like something from a Christopher Nolan set or the Metropolis conjured drawn from Fritz Lang’s imagination one inspirational day in Weimar Germany torn apart between two wars. From this eyrie London is set out before you. Striding along the Capital Ring in the borough of Bromley you emerge from the coiffured lanes of a pampered suburb and step inside a Plantagenet masterpiece which is Eltham Palace. Later it became a hunting palace for Henry VIII before it was built upon by a modern king of commerce. The art-deco addendum pays homage to the wealth of the textile magnate of the 1930s, the Courtauld family. They made a good job of restoring the grounds and the interior of the buildings with their restoration of Eltham Palace.